Sandra recently told me she doesn’t need any more things so I decided to make her some personalised soap for her birthday. We all need soap. So here is your present, Sis – 12 bars of soap. Happy birthday! I hope you like them. I got the idea after making curls and embedding them in soap. I figured, if I could make curls, I should be able to make letters. 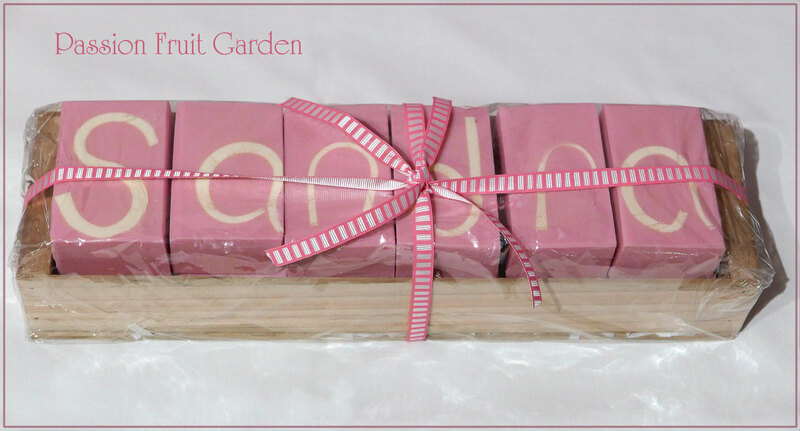 And I thought personalised soap would make a lovely present for someone who doesn’t need anything. The idea was born. Luckily for me, ‘Sandra” is made up of letters that can all be formed in one piece. Some other letters would be more problematic. I learned so much making the letters. I was really getting the hang of it by the end. The trick is to use a recipe where the soap is still pliable the next day but not sticky. Making nice even slices of soap at least six centimetres deep and long enough to mould each letter was the hardest part. Maus made me a cutter that made five mil slices but it was nearly impossible to make the slices even. The blade we used kept buckling, consequently, the soap came out all different shapes. Late in the experiment, I found I could roll the soap like pastry which really helped with the evenness. Once I had formed the letters, I tied them up with string so they wouldn’t unravel before they had set. The next day we placed them in the mould and poured the pink batter around them. With all those lessons learnt, I reckon, next time, I will be quite good at it. This was my first try and I am pretty happy with it. OK, I got glycerine rivers in the white (bloody titanium dioxide), the letters are a bit wobbly and of uneven thickness and some wanted to fall over as I poured the pink batter. Thankfully, Sandra loves me and, I am sure, will forgive these imperfections. This entry was posted in Rants & raves and other fun things and tagged Personalised cold process soap by Glenda. Bookmark the permalink. Fabulous. Did Maus make the wooden box which they fit into perfectly? Yay. You have your new camera and what a fabulous idea of personalised soap. Happy birthday to your sister. Mandy I have been reading, reading, reading about me new camera. It is pretty cool. Thanks Moya, I think she is pretty happy with the soap. I hope so anyway. I am making my way through the manual. The camera is pretty cool. You are so clever! They are great. Thanks Maree. I really like the idea. Quite often you give gifts when you really know the person doesn’t need any more stuff. At least with soap it is really nice and can be used. And most people don’t spend money on buying quality soap so you know it will be special for them. My goodness, your soap just keeps getting better. Absolutely love what you do and, yes, as dianeskitchentable has already said, these would sell like ‘hot cakes’ at a market. So, so wonderful. Love it. And, you are so clever, Glenda! Thanks Liz, you are generous. Hi shortie, The imperfections are pretty obvious close up but the soap is just as good. whether the pattern is perfect or not. What a wonderful gift. I can see lots of potential here if you ever decide to do another fair. You could make up batches of all letters…more of the most common, and then customers could buy their own messages. It would make great gifts for all occasions. Hi Diane, as I mentioned to Yvonne, you have to make it as one long log and then cut it up. I would have to make them to order. Looks like you have the hang of the new camera already. Great pictures, great present for Sandra. Hi Matt, Thanks for the compliment but I am floundering in the dark. It does help being familiar with digital cameras. I will really sit down with it tomorrow.